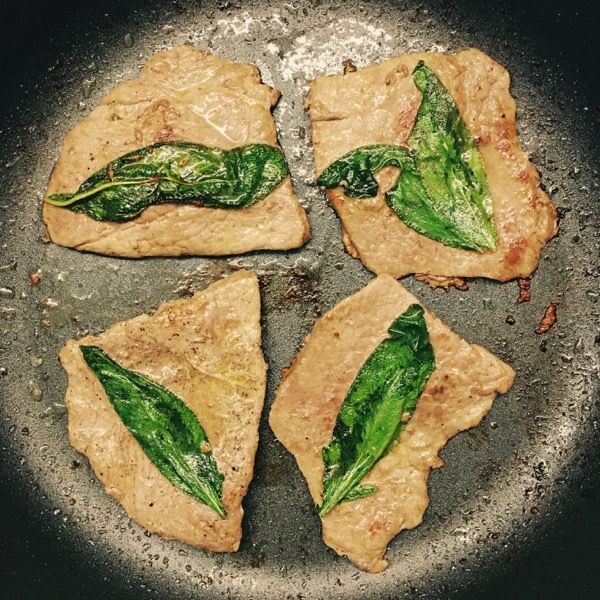 Posted on June 22, 2016 June 22, 2016 by Mara L.
Scaloppine Di Vitello Alla Salvia, By Mara L.
There’s a garden with herbs and salads right outside of the kitchen where I’m currently visiting. I’ve been carefully harvesting single leaves of salad, following the gardener’s instructions on how to use up a little bit at the time and keep it growing. And I’ve been using bits of thyme and sage. But the sage is so exceptional that I needed a dish that was all about it. 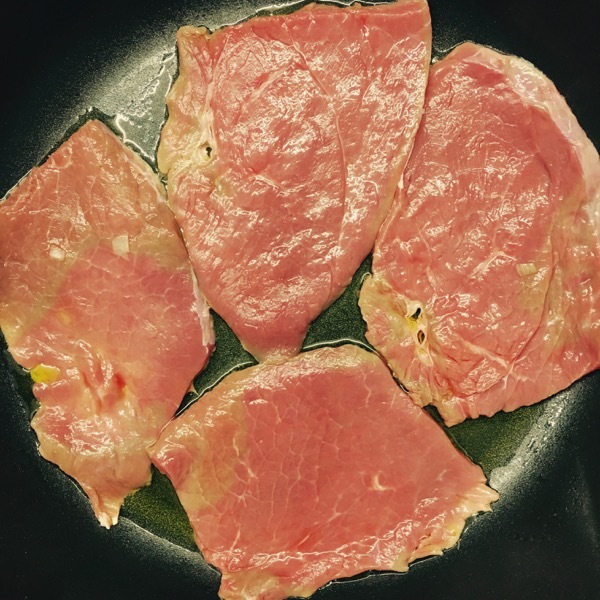 I got thin slices of veal, beautifully cut by the local butcher. If you don’t mind splashes of hot olive oil, you can put the meat into the pan when the oil is already heated. In a sense, that’s ideal, because then the meat is seared right away at high temperature. But I prefer to lay out the scaloppine nicely, and I can’t do that when the pan is hot. If you’re doing it my way, you need a bit of patience. The pan will heat up gradually and nothing much happens right away. You’ll need to wait for the meat to sear. 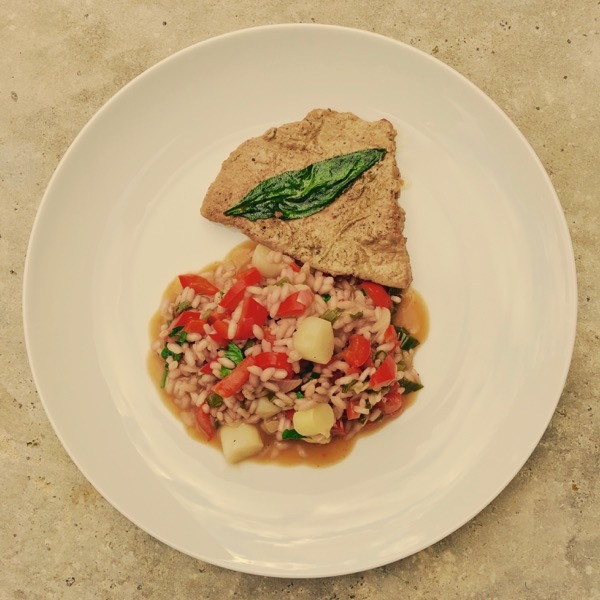 But that’s OK, because with scaloppine it’s not all about the crust. It’s also about moisture and softness. I’m using lemon, and I have strong views on cooking with lemon. For decades, it had a bad reputation, counting as the lousy cook’s way to substitute for tasty ingredients and sophisticated preparation. Everything, chefs say, tastes a bit more intensely with lemon. So using it can seem to be a kind of fraud, as if you’re making your food seem better than it is. My view: that’s all nonsense! Lemon has a wonderful and distinctive taste. And what’s wrong with things tasting better than they otherwise would? So once it looks like the meat is browning up, I squeeze a bit of lemon juice on each piece of meat individually. All in all, you’ll think this isn’t a whole lot of meat, given how thin it is. Right! I’m not a vegetarian, but I love vegetables and I care about all the reasons for cutting down on meat consumption. So overall, I’m aiming for a vegetable-heavy ratio. And after a few days of cooking, I had various left-overs: bits and pieces of different vegetables and some red wine that turned out to taste a bit different from what we had imagined. Perfect ingredients for a simple risotto, which went nicely with the scaloppine. Previous PostPrevious Mozzarella Di Bufala And Spaghetti Ai Funghi, By Mara L.
Next PostNext Simple Pasta, By Mara L.